I’m told it’s Thursday already. How the heck is it Thursday already?!? I feel like I somehow skipped Tuesday and Wednesday, is that even possible? You see this week was supposed to be busy, but somehow it got even busier for 2 reasons (so far). First, in a moment of calm I decided to take a quick trip to Starbucks, because you know, why not buy myself a warm treat? Well, on our way home, I broke my car. 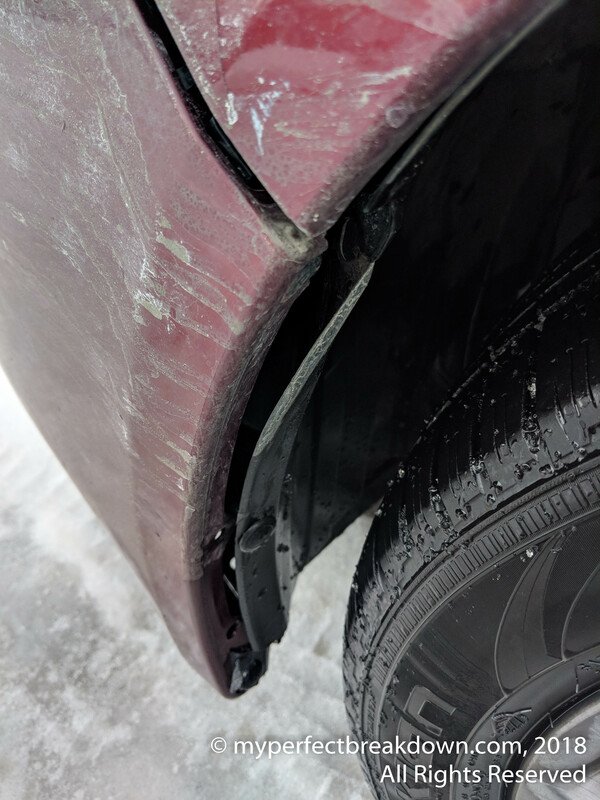 You see, our residential roads are so bad from melting/freezing snow and ice, that I hit an ice rut, my tire slammed down and the front end of my car slammed into ice and my bumper is now hanging off my car. Truthfully we’ve debated not fixing it, but I spend so much time driving for work in rural back roads that the last thing we want is for my car to break even more in the middle of no-where with no-one around to help me. So I basically ended up taking half the day off work to get 2 repair estimates done. They are basically identical – worst case scenario is that the entire bumper needs to be fully replaced which will cost $1008.52. If not, it’s only $398, but they wont know until they take my car apart. And of course our insurance deductible is $1000, so there’s no point on going through insurance. So, I’m rather pissed off about the whole thing. This is seriously the most expensive Chai Tea Latte I’ve ever had in my life. (Also, as an aside, why are car places so horrible to women? It’s the one place in my life that I always feel like i’m getting screwed and treated poorly and over-charged. The one place actually demanded I sign a waiver for them to begin work on my car before I even had a quote and were shocked/angry when I refused to sign it. Needless to say that place will never see me again because I’m just not that stupid). Second, Little MPB went for his pneumonia x-ray follow-up. For the record, x-raying a 2 year old is not fun. Thankfully we had an amazing x-ray tech who was willing to work with us in order to avoid the horrible toddler torture device. It took 2 adults to hold Little MPB, a few stickers and a lot of patience from everyone in the room. But we were able to avoid blood curdling screaming so I deem that a success! But, then we got a call from our family doctor the next day asking us to come in to discuss the x-rays. They told us it wasn’t urgent, but they squeezed us in for an appointment the very next day. Also, our clinic doesn’t make us come in unless something is wrong. So, cue panic. Mr. MPB and I both cleared our schedules and off we went as a family, because when we are panicked, we all go. The Doctor indicated there is still evidence of pneumonia in his chest, but it’s drastically improved from the original x-rays. Apparently this is typical because it takes so long for the lungs to heal from pneumonia. So, no need to worry about that. But, there is also evidence of thickening of the bronchioles near the middle of his chest. This is potentially an early indicator of asthma, but they very rarely diagnosis asthma at Little MPB’s age. But, it could also just be an odd anomaly that doesn’t show up in a few months. For the moment, the Doctor indicated that Little MPB’s lungs sounded absolutely fine so he’s not worried but he wants us all to be aware of the possibility of asthma over the next few years. Our doctor also forwarded the x-rays to Little MPB’s pediatrician for a second opinion (we have a follow up appointment with her in a few weeks, so the timing works out well). So, now somehow it’s Thursday. And, I need the weekend to start. And I cannot help but worry because I’m told bad things come in threes…. Ugh, that really stinks about your car! I hate when stuff like that happens. And I totally agree about car repair places and their attitudes toward women. I’m glad to hear that your little boy’s doctor is pro-active. Here’s hoping that this abnormality is somehow associated with the pneumonia and clears up on its own. I’m sorry so much has gone wrong this week. Hopefully your weekend is uneventful and you have a better week next week! well that’s a rough week! hopefully next week is better and that your little one’s pneumonia clears up all the way very soon.